Find your happy place at A Place at the Beach III Resort on Shore Drive in North Myrtle Beach, South Carolina. This jewel set on the Grand Strand is a sprawling three-story rental condominium complex, framed by palmettos against stunning ocean views. If you are seeking a fun, relaxing vacation located directly on the beach, look no further! It has been found at A Place at the Beach III. The resort features nicely furnished condos filled with a bright, beachy ambiance and all the comforts of home. As you meander throughout the resort, feel your worries melt away, knowing you are miles and miles away from the realities of the everyday hustle and bustle of ordinary life. Sparkling pools, white sandy beaches, and glittering oceanfront views make this resort a special treat. A Place at the Beach III Resort is a perfect balance of comfort and paradise. Lovely rental condos include practical, well-equipped kitchens and bonus balconies overlooking the Atlantic Ocean. Spend your days poolside, or wander down to the beach, where warm sand will cushion your toes and ocean waves will lap at your ankles. 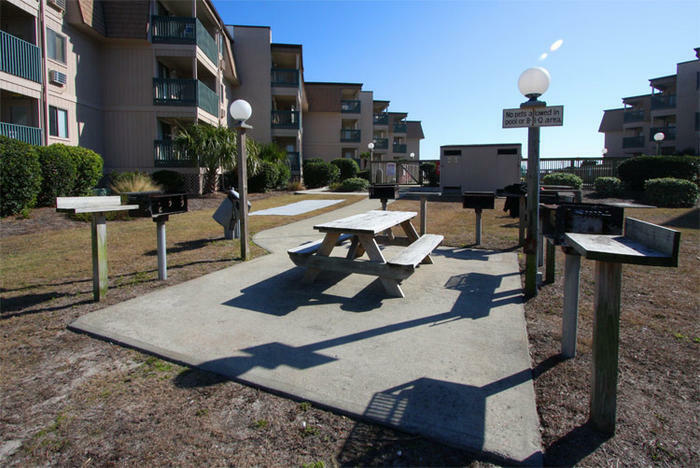 In a prime location, this vacation condo resort is near a plethora of North Myrtle Beach, South Carolina, restaurants, shopping, and attractions. Here, you choose your own pace. Golfers will be in their element with over 100 courses to green their days, including the nearby Arcadian Shores Golf Club. Guests passionate about fishing have their choice of piers, boats, and deep-sea expeditions. Lovers of culture will be pleasantly surprised at the variety of music and artistic opportunities available in North Myrtle Beach, including the Alabama Theatre, Carolina Opry, and eclectic art galleries. Thrill seekers can fuel adrenaline rushes by jet skiing, Jetpacking, Flyboarding, parasailing, and skydiving, just to list a few! The culinary connoisseur in your group will delight their taste buds with more than 1,000 restaurant options. A Place at the Beach III Resort is within walking distance to the Apache Pier and just down the road is Barefoot Landing. A popular attraction on the Intracoastal Waterway, Barefoot Landing is a charmingly unique setting for shopping, dining, entertainment, and nightlife. Immerse yourself in the rich history and diverse ecosystems of South Carolina by taking a tour of the legendary Lowcountry, visiting plantations and museums and exploring the wild beauty of the area - even spotting the occasional alligator! Your North Myrtle Beach vacation at A Place at the Beach III Resort rental condominium gives you access to all of this and more. Elliott Beach Rentals is not affiliated with onsite management or the HOA of A Place At The Beach Iii.